On the 12th of March 2011, just one day after the big earthquake and tsunami in Japan, my mother suddenly died. I went to my home country, Israel, and watched on TV from there the news of the first tragic week in Japan. Every night, I phoned my wife in Japan, but she sounded much more calm than how things looked from outside…by that point, I started to suspect that the Japanese media wasn’t telling the whole truth. I came back to Japan, and 2 weeks later I volunteered to be a translator for an Israeli support-team to the Tohoku area. I had a chance to watch from close up and in real time the power of nature, and to understand that there is no way a man-made construction can withstand it. On June 2011 we gathered with some friends, I showed them the pictures I took of Tohoku, and we started to think if there was anything that we, as individuals, could do in order to stop the use of nuclear plants. 30 people discussed for almost 7 hours! Each member of that group was very happy to recognize that s/he was not the only one who was really worried about the future. This was the first step of “The Chichibu people’s group against nuclear power plants.” Since that time, for more than 7 years, we gather every 2 weeks, each time for a 3~4 hour meeting of 10~15 persons. We started by inviting lecturers, studying about nuclear plants and the way people inside them work, about radioactivity, air and sea pollution, energy…we invited lecturers from Tanpopo-sha, Greenpeace and more, went on study-tours, and understood that we must raise our voices for a better future! 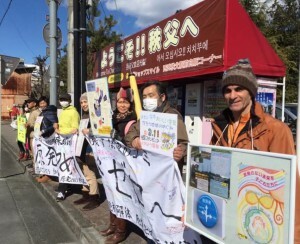 Our group started to take part in demonstrations in Tokyo, and also to have our own small ones in our local area. We bought a radioactivity-measuring device, and used it to measure some points in our area once a month, trying to look for changes, and to record good data for the future. Once in 2 years, we have a study-tour to the Fukushima area, focusing on 20 km range from Fukushima-daiichi, trying to talk with people who live there about their problems and thoughts. After that, in our area, we have an event of showing by pictures, short movies and talks, our experiences and their difficulties. Once a year, on the 11th of March, we produce a “don’t forget Fukushima” poster, deliver it inside the morning newspaper of that day to about 20 thousand houses in our area. Our group was established originally as a group against nuclear plants and nuclear power, but we understood that social problems are in a variety of areas and subjects, so nowadays we are raising our voices also against war, against changes in Article 9 of the constitution, and a big voice for human rights. Our meetings take place in “Kuro Usagi (black rabbit-an endangered species)” which is a very good and healthy bakery in Chichibu, eating “leftover” bread and thinking seriously about Japan’s and the world’s future. We are open and will be happy to cooperate with anybody for whom the future is important.